#1: Getting an Uzbekistan tourist visa is no lengthier than preparing instant noodles. If you remember, I said the same about getting Sri Lankan tourist visa. More or less, they take equal time to fill up online. Applying and procuring visa is the second trickiest part in the algorithm of every foreign trip, the first being the travel expense of course. Thankfully, Uzbekistan has grown tourist friendly over the years in her visa protocols. Citizens of few countries who can enter Uzbekistan without a visa are- Azerbaijan, Armenia, Belarus, Georgia, Kazakhstan, Kyrgyzstan, Moldova, Russia, Ukraine, Israel, Indonesia, Malaysia, Singapore, Turkey, Japan, Tajikistan and Republic of Korea. Yes, India is not in this list. 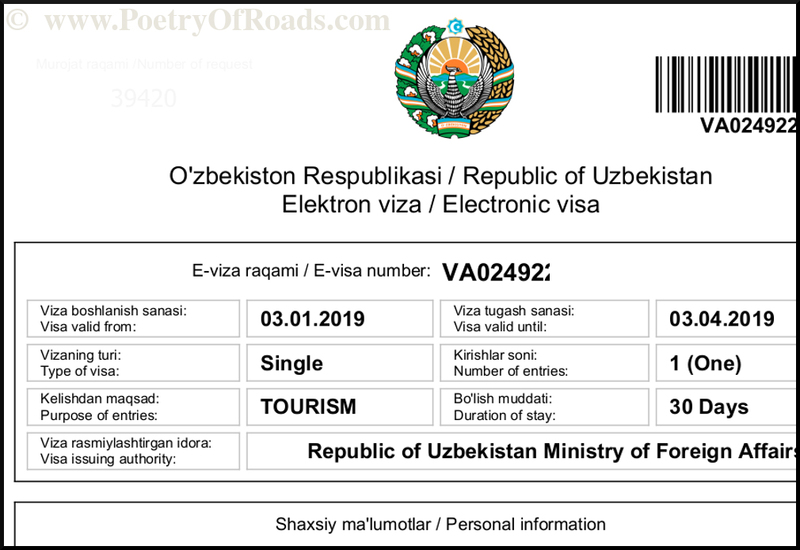 But, Indians can easily apply for an e-visa on the official electronic visa portal of the Republic of Uzbekistan for a fee of 20 USD. The online form is pretty straightforward and one needs to upload his scanned passport copy along with recent facial photo as per technical guidelines specified the portal. Usually, the approved e-visa is sent to the applicant's email address within 2-5 days. Get a print-out. You'll have to present it in the immigration desk along with your passport and flight tickets for a hiccup-free experience in the Tashkent airport. #2: The flight journey is visually exciting in itself as you fly over the Hindu Kush mountain range. Uzbekistan Airways operate direct flights from New Delhi and Mumbai. I had boarded from New Delhi, and was clever enough to check-in early to grab a window seat. Our real-time position was being displayed on multiple screens in the cabin. We crossed Punjab, a substantial distance over Pakistan and Afghanistan, before finally entering Uzbekistan. Due to our eternal differences with Pakistan, getting a Pakistani tourist visa is nearly impossible for Indian nationals. Despite featuring several exquisite destinations like Herat, Bamiyan, Panjshir Valley etc, any traveler with a sane mind would only dream of visiting Afghanistan. Getting aerial view of these two countries in the same journey can be a potent consolation for most backpackers. The Hindu Kush, with its collection of infinite snow-capped and barren rocky peaks, is a 800 kilometers long mountain range which stretches from central Afghanistan to northern Pakistan, forming the western block of Hindu Kush Himalayan Region. Well, you have to embark on a flight to Tashkent to admire this majestic and stunning eye-level view of the colossal Hindu Kush range. #3: Transportation in Uzbekistan is hassle-free. The most popular cities of Uzbekistan, from a traveler's perspective, are Tashkent, Samarkand, Bukhara an Khiva, where one can find architectural marvels of the great Silk Road times. If you check the map, these cities can be connected by a line, i.e. you can visit them serially. Railways connect all of them. Bukhara and Samarkand are further connected to Tashkent by a fleet of high-speed trains which shortens your travel time! A rough figure will help you understand how convenient it has become. One way journey in an Afrosiyob train from Tashkent to Bukhara (north of 550 kilometers) lasted about 3.5 hours, and costed me 22 USD. Explore these cities on cab without the apprehension of getting-hyper-charged, which you encounter so often in India. If the driver quotes you 20,000 UZS (Uzbekistani So'm/Soum), you can smile and offer 15,000 UZS. But rest assured, you have to be that special unlucky one to encounter an expensive rip-off. On an average, I spent 10,000 UZS (~ 1.19 USD) for every 3 kilometers of taxi ride. If your itinerary allows, take a metro ride in Tashkent. The Tashkent subway, with its beautifully decorated 29 stations and 3 lines, is the only subway in the central Asian region and a strategically important transport system of the capital. #4: Harmonious coexistence of contrasting geographical features makes Uzbekistan more riveting to nature lovers. The topography of Uzbekistan is an amazing combination of flat and mountainous terrains. The mountains of Uzbekistan belong to the southern and western ranges of Tian Shan. Plains are located on the southwest and northwest of the country. Poetically, the green plains, like oriental beauties are watchfully fortified by mammoth mountains which remain perpetually covered with snow. There, you can experience very hot summer and equally cold winter. We Indians are not particularly interested on the Uzbek summer. Silver lining is the low humidity. Visit Uzbekistan in winter, but remain well-equipped. Northern part of the country gets really cold and temperature can sink as low as -40 degree Celsius! Although, most part of Uzbekistan is very dry, if you travel in autumn, you'll be pleasantly surprised by the variety of fresh fruits and vegetables stacked in the local market. Mind it, everything is organic there! #5: The sheer depth of Uzbekistan's history and culture has earned UNESCO World Heritage status for four of her archaeological sites- Itchan Kala in Khiva, Historic Center of Shakhrisyabz, Historic Center of Bukhara, and Samarkand. I was fortunate enough to explore last two of them. The erstwhile great Silk Road passing through the country has made a longstanding impression on the historical significance of a number of cities among foreigners. Archaeological findings in the territories of Selengur, Kulbulak and Teshiktash monuments prove that the first human settlements on the territory of Uzbekistan appeared hundreds of thousands years ago. Go there and see for yourself how blue domes, minarets of medieval mosques and eastern old-world style markets are neatly interwoven into the canvas of a modern, dynamic and rapidly developing urban panorama. Uzbek culture is very bright, unique and diverse. Customs and traditions of the land express themselves through music, dances, arts, crafts, language, cuisine, clothing and everyday life. #6: Uzbek cuisine is not only mouth-watering but also high on nutritive value. If you're a foodie you must be grinning now, right? The history of the national cuisine of Uzbekistan is as old as the history of the Uzbek people. If you're a classic food enthusiast, you can perceive influences of Kyrgyz, Kazakh, Mongolian, Uighur and Turkic cuisines in Uzbek food. Pilaf is the most widely regarded dish and it is prepared differently in different regions of Uzbekistan. Tashkent Pilaf, a whole ensemble of flavors, is one of the brightest representatives of Uzbek pilaf with a special method of preparation. The gastronomic casket of the country presents a bouquet of oriental aromas in its highly appetizing meat dishes, with an abundance of fresh vegetables and herbs. Narin is another popular Uzbek dish. It is finely chopped noodles in combination with horse sausage. Narin is served with hot meat soup, noodles are sprinkled with finely chopped onion rings and fragrant black pepper. Halim is a very delicious dish of meat and wheat grains which is worth trying while you're in Uzbekistan. Having tasted hot bread, pilaf, and green tea you might just catch the true spirit of Uzbek food culture. You'll be amused to know, despite all these Uzbek people find Indian foods hard to digest. #7: Backpacking in Uzbekistan is easy, affordable and safe. A part of its credit goes to the well developed transportation system which I have already elaborated in the third point. Uzbeks are definitely very friendly and welcoming. Uzbek script is similar to English, but words are pronounced quite differently. Do not expect your English vocab to help you much while backpacking the great Silk Road map. Polite hand gestures, a lot of smiles on your face and broken words can be more useful in establishing connection with locals out there. It will get lot smoother once you invest few bucks on a local SIM card and use the online translator. Ample accommodation options befitting everyone's budget are available in Tashkent, Samarkand, Bukhara and Khiva. You can easily get a single room for as low as 10 USD. Price of most of the daily consumables are comparable to what we pay for them in India. Admit it or not, this gives a sense of being in control. 90% of population in Uzbekistan are Muslims. Yet, it is a secular country. In my 5 days of travel, I didn't find a single instance of religious prejudice and I loved it. In upcoming posts I'll talk about three cities I visited in Uzbekistan. I might give you a hint of my upcoming international trip. So, take care and return soon.